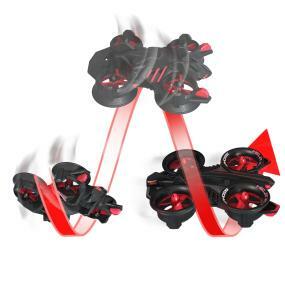 Experience the future of flight with the Air Hogs Helix X4 Stunt RC. 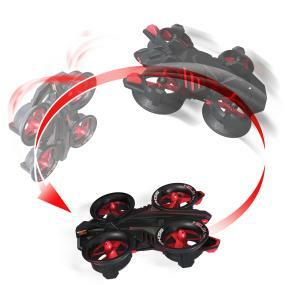 This uniquely designed, high-performance Quad Stunt Copter is designed for older children looking for indoor remote controlled stunt performing excitement. Press the red stunt button and instantly perform back flips, barrel rolls, and even 180-degree Flips like an expert. It’s the ultimate stunt quad copter that will leave pilots begging for more. Built with two distinct control modes, beginners will have fun learning to fly, while advanced pilots can work on mastering their flight path and tricks. Both will find it addictive as they can practice figure eights and circles or work on their orientation skills. 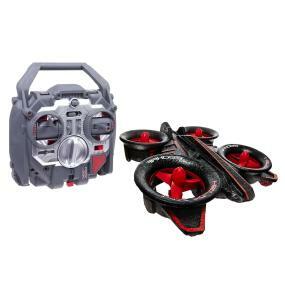 Highly maneuverable and fast, the lightweight frame makes it perfect for an indoor radio control copter. Its unique four-ducted fan design, lets pilots hover in place, while the on-board gyro stabilization helps ensure a stable and easy to control flight. Whether they’re quickly flying around obstacles, showing off their agile moves, or just hovering in place, the Helix X4 Stunt provides great control and amazing maneuverability. The lightweight frame makes it perfect for indoor flight, while its crash resistant materials protect the rotors and deliver superior durability just in case you crash into a wall or obstacle. With the easy to charge USB cable, adults and kids will be back in the air in no time as they have a blast experiencing the future of flight with the Helix X4 Stunt.